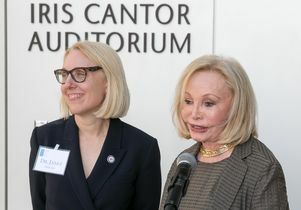 The gift from Iris Cantor (right) funds an endowed chair to be held by the director of the Iris Cantor Women’s Health Center, currently Dr. Janet Pregler (left). 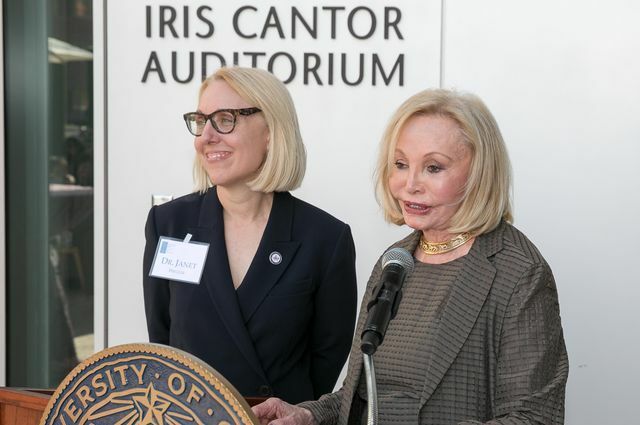 A $10 million commitment from philanthropist Iris Cantor will enable the David Geffen School of Medicine at UCLA to advance its work in educating the next generation of clinicians and scientists in women’s health care. 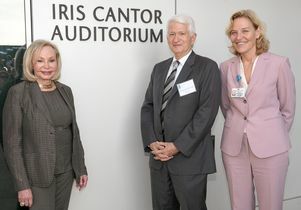 Cantor, a longtime UCLA donor and a champion for women’s health, was honored at a campus event Sept. 27 by UCLA Chancellor Gene Block and Dr. Kelsey Martin, dean of the Geffen School of Medicine. Of the new commitment, $8 million will support training and education in women’s health care at the medical school. Cantor has provided funding for three pioneering centers at UCLA to serve women: the Iris Cantor Center for Breast Imaging, which also deployed a mobile unit to serve the community; the Iris Cantor–UCLA Women’s Health Center, one of the first comprehensive women’s health centers in the nation; and the Iris Cantor–UCLA Women’s Health Education and Resource Center, which supports community outreach programs. “Iris’ desire to address health care disparities was the genesis of these wonderful centers,” Martin said. The new commitment includes $8 million to support training and education in women’s health care at the David Geffen School of Medicine. The visionary gift also funds a $2 million endowed chair, the Iris Cantor Endowed Chair in Women’s Health, an administrative chair to be held by the director of the Iris Cantor Women’s Health Center, currently Dr. Janet Pregler. 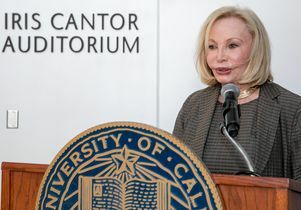 To leverage the power of her transformational gift supporting women’s health at UCLA, Cantor had challenged the center’s community advisory board to raise an additional $2 million for the chair. The board’s successful endeavor brings the total endowment to $4 million. Since it was established 23 years ago, the Iris Cantor–UCLA Women’s Health Center has helped develop a women’s health curriculum for UCLA medical students, and its advisory board has funded more than $2 million in support of early-stage research in women’s health, which its members have leveraged into an additional $21 million from other funders to advance the understanding of women’s unique health needs. “Thanks to Iris, generations of women have been empowered to take command of their health and inspired to get involved. I believe we can safely say that Iris’ philanthropy reflects her passion and her ability to inspire others to take up the cause,” Martin said. 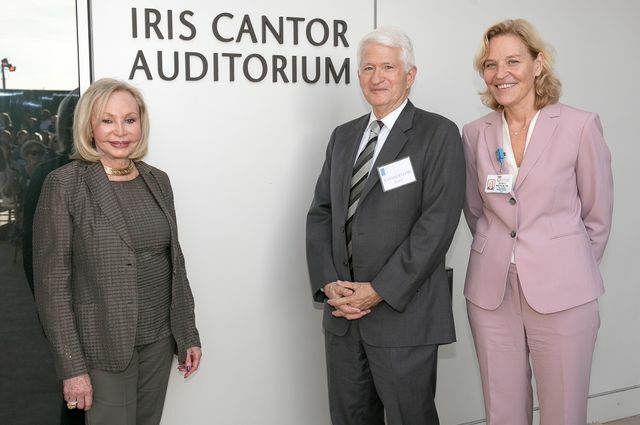 In recognition of Cantor’s philanthropy, UCLA has named the Iris Cantor Auditorium at the David Geffen School of Medicine. The signage commemorating the newly named auditorium was unveiled at today’s reception. The auditorium is located on Level 1 of Geffen Hall, the state-of-the art medical education building housing the school of medicine. As chairman and president of the Iris & B. Gerald Cantor Foundation, Iris Cantor is dedicated to enhancing cultural life through the visual and performing arts, and to advancing knowledge to address the foremost medical challenges confronting humankind. She and her late husband, Bernie Cantor, funded cutting-edge research on kidney disease, diabetes and diseases of the eye, and they established a number of important programs and facilities devoted to women’s health. Since assuming leadership of the foundation in 1996, Iris Cantor has strengthened its commitment to medical research and health care. This gift is part of the UCLA Centennial Campaign, which is scheduled to conclude in December 2019 during UCLA’s 100th year.